These pages show the cruise ship postcards produced by Simplon Postcards, plus galleries of official company and other commercial cruise ship postcards. Cards are also listed by country. The quickest way to find a ship or fleet on this website. These postcards are not available for sale. Admiral Cruise Line - successor to Eastern Cruise Lines. Aida Cruises - now part of P&O. American Hawaii Cruise - New pages devoted to postcards of American Hawaii Cruises. Attika Cruises - link to the Arcadia. Canadian Pacific Lines - the postwar fleet spent much time cruising. 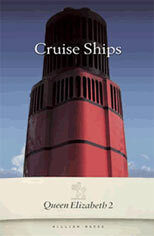 Carnival Cruise Line - Four pages devoted to postcards of Carnival Cruise Line. Celebrity Cruises - Postcard history of the fleet. 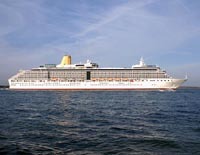 Classic International Cruises - links to Funchal and Princess Danae. 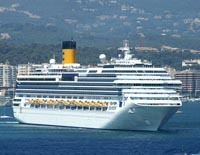 Commodore Cruise Line - to be completed - links to Caribe I at present. Costa Lines - a postcard history of the company. Costa - Current Fleet - Official postcards of the current Costa fleet. Crystal Cruises - a postcard history of the company (to be completed). Cunard Line - a postcard history of the company (to be completed). Deilmann - Page added December 2001. Deutsche Atlantik Linie - The passenger fleet in postcards. Direct Cruises - complete fleet in postcards. Discovery Cruises - Short cruises from Florida. Disney Cruise Line - Disney Magic and Disney Wonder postcards. Dolphin Cruise Line - complete fleet in postcards (later joined Premier). Dolphin Hellas Cruises - link to the Aegean Dolphin. 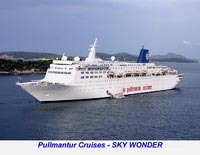 Eastern Cruise Lines - later Admiral Cruise Line. Festival Cruise Lines - the complete fleet in postcards. 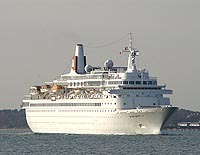 Fred Olsen Cruises - Postcards of the current three ships Black Prince, Black Watch & Braemar. Golden Sun Cruises - the complete fleet in postcards. Greek Line - a postcard history of the company, involved in cruising in later years. Grimaldi-Siosa Line - Italian emigrant line which later turned to cruising. Hanseatic Tours - The passenger fleet in postcards (part of Hapag-Lloyd). Hapag-Lloyd - a postcard history of the company. Hebridean Island Cruises - a postcard history of the company. Holland America Line - a postcard history of the company (to be completed). Home Lines - a postcard history of the company. Japan Cruise Line - current fleet in postcards. Lauro Lines - Achille Lauro's fleet of cruise ships. Louis Cruise Lines - current fleet in postcards. 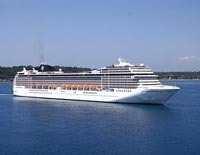 Mediterranean Shipping Cruises (MSC) - current fleet in postcards. Monarch Classic Cruises - current fleet in postcards. Norwegian Cruise Line - the fleet in postcards. Orient Lines - the fleet in postcards (part of NCL/Star Cruises). P&O and Princess Cruise Lines - the fleet in postcards. Peter Deilmann Cruises - Fleet History in Postcards. Premier Cruise Lines - a postcard history of the company. Regal Cruise Line - Link to the Regal Empress, the line's only ship. 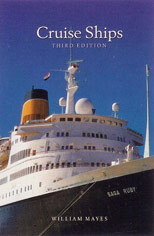 Regency Cruises - a postcard history of the Lelakis Group company, 1984-95. Royal Caribbean Cruise Lines - current fleet in postcards. Royal Cruise Line - fleet history in postcards. Royal Olympic Cruise Lines - current fleet in postcards. Royal Viking Line - currently links to Royal Viking Sun. Scandinavian World Cruises - Short cruises from Florida. 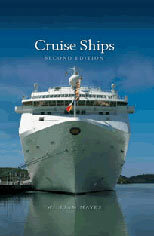 SeaEscape Cruises - see Scandinavian World Cruises. Seawind Cruise Line - Link to the SeaWind Crown/Vasco da Gama, the line's only ship. Seetouristik - currently links to Aida. Shaw Savill Line - The brief period of Shaw Savill Line cruising from official colour postcards. Star Cruises - current fleet of fast-growing Far East fleet in postcards. Starlauro Crociere - the fleet in postcards. Swedish American Line - Postcard history of the company , which turned to cruising in later years. Swan Hellenic - the fleet in postcards. Thomson Cruises - the fleet in postcards. 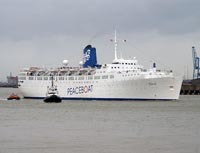 Trinity House - In 2003, Trinity House started carrying cruise passengers on the THV Patricia. Transocean Tours - German cruise line. United States Lines - the year 2000 company with the ship Patriot. Western Cruise Lines - subsidiary of Eastern Cruise Lines.